Leeds United head coach Marcelo Bielsa has stressed the importance of Jack Clarke understanding the need to continue at Elland Road. The 18-year-old winger broke into the Leeds first team squad earlier in the season and has gradually become an important part of Bielsa’s plans at the club. The teenager’s performances have also attracted the prying eyes of several Premier League clubs, who are interested in snaring him away from Leeds in January. Leeds have already rebuffed an enquiry from Crystal Palace, but could face a battle to hold on to him as Manchester United, Tottenham and Southampton have also been keeping tabs on him. The Yorkshire giants have made it clear that they won’t sell the player this month, but Bielsa believes it is important to understand what the player wants too. "The important thing is the position of the club”, the Leeds boss said in a press conference when asked whether it is vital for Clarke to continue at the club for his development. Bielsa also insists he has not discussed the transfer talk with the youngster. "We haven’t talked about this subject. "I didn’t talk about it with him." 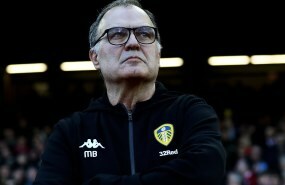 Leeds are reportedly valuing the player in excess of £10m but his suitors fear that his price could go through the roof if the Whites are in the Premier League next season.